As ever, the publication of Reported Road Casualties Great Britain, (RRCGB 2013) is an important event in the road safety calendar. For the past few years, casualty reduction appears to have stagnated in Great Britain, with various possible explanations provided. With every passing year where the casualty figures do not return to the general trend, the question must be asked: is this the end of the golden era of casualty reduction in Great Britain? The key findings of RRCGB 2013 include a 2% reduction in road deaths in 2013 compared to 2012, representing the lowest number of deaths since national records began in 1926. “The number of people seriously injured decreased by 6 per cent to 21,657 in 2013, compared to 2012 [and] the total number of casualties in road accidents reported to the police in 2013 was 183,670, down 6 per cent from the 2012 total.” This all sounds like positive news – deaths down to the lowest figure since the early decades of the 20th century and reductions of 6% in serious and all casualties. However, as can been seen by the chart (left), there has been a definite slowing down in casualty rates in recent years. Compared to the 2005-09 average, there were clear downward trends in serious and slight casualties from 2000 to 2010, when the numbers of casualties have plateaued. With fatal casualties, the trend was less consistent with other periods where numbers of deaths didn’t reduce (2000-2003 and 2004-2006) but there had been a period of clear reductions from 2006 to 2010. The rates have stagnated across road user groups: the following chart shows the four largest casualty groups against per billion miles travelled, indexed against the 2005-09 average. 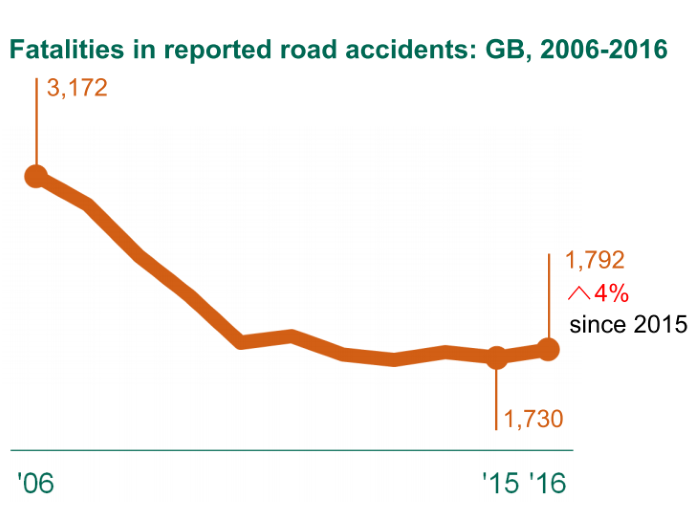 Whilst the largest gains in casualty reduction have been made amongst car occupants (43% compared to 2005-09), reductions have slowed significantly since 2010. For the more vulnerable road users of pedal cyclists motorcyclists and pedestrians, casualty rates per billion miles have not reduced as much as car users since 2005-09 and reductions have also slowed since 2010. So, since 2010, why have casualty numbers remained roughly the same? Have all the large gains in casualty reduction been made? Whilst one year could be considered a ‘statistical blip’, after four years, what could be preventing further casualty reduction? And lastly, and most importantly, as the flat-lining trend continues, is there anything we can do to get casualty reduction back on track? What affects the casualty trends? “What affects the casualty trends? These factors will have both reduced the likelihood of an accident in the first place, as well as reducing the severity and number of casualties when they do occur. Shorter term trends can also be driven by economic factors. There is evidence that economic recessions have accelerated decreases in road deaths, although the relationship between GDP and fatalities is neither simple nor linear. The rest of this article works through these factors in reverse order. In 2010, there was a 17% reduction in road deaths compared to 2009 and 2010 was also the coldest year since 1986, with widespread snowfall and frosts in January, February, November and December. In comparison, whilst 2009 had rainfall 8% over the UK average for 1971 to 2000, it was also slightly warmer than average. The adverse weather in 2010 could have played a major part in the high casualty reduction experienced that year. Given that 2010 saw unusual weather, perhaps it is not unexpected that 2011 saw a 3% increase in road deaths when UK rainfall was close to average and it was the second warmest year since Met Office records began in 1910. Whilst adverse weather can explain the large casualty reduction seen in 2010 and the smaller reduction in 2012, the ‘normal’ weather patterns for 2011 and 2013 suggest that the previous downward trend of casualties has slowed for some other reason. Road deaths, however, have also been falling in periods when both GDP and traffic were growing and so the relationship between the economy and road deaths is definitely not clear. It can be concluded, though, that economic recessions have accelerated reductions in road deaths. Economic recovery has been slow since 2010 and therefore it might be expected that casualty reduction might have continued to be strong. It is not clear how the relationship between the economy and road deaths can explain the slow progress in casualty reduction since 2010. Improvements in post-accident care over time will have had a profound effect on survivability of road collisions. The creation of major trauma centres in England in 2012 should also improve survivability. There have been major improvements in vehicle safety systems over the last few decades and these will also have played a part in the long term casualty reduction trends. There have also been major changes in highway technology and engineering. Many of the large scale engineering schemes identified to improve safety have been completed and it is becoming increasingly difficult to identify appropriate cost-effect solutions at sites. Furthermore, many ‘hotspots’ have been treated and collisions are occurring across the network, where engineering solutions are not appropriate. All of the above might mean that it will become increasingly difficult to achieve the casualty reduction rates previously experienced whilst these changes were being implemented. Reductions in vehicle speeds over time will also have affected casualty rates. “Since 2003, average free flow speeds for all vehicle types across each road classification have remained broadly stable.”The following chart shows that since 2003, the percentages of motorcycles, cars and LGVs exceeding the speed limit on motorways has reduced. It shows that for cars and motorcycles the greatest reduction in the percentages exceeding the limit were seen between 2005 and 2008 (after the formation of the National Safety Camera Programme) and whilst reductions have continued since 2011, the reductions are lower. Perhaps the reductions in the percentage exceeding the speed limit have slowed because levels of speed enforcement have reduced. Alternatively, it could be that as the percentages of motorists willing to exceed the limit become lower, it becomes harder to change the behaviour of the minority. Proving the effectiveness of road safety education and training is incredibly difficult. 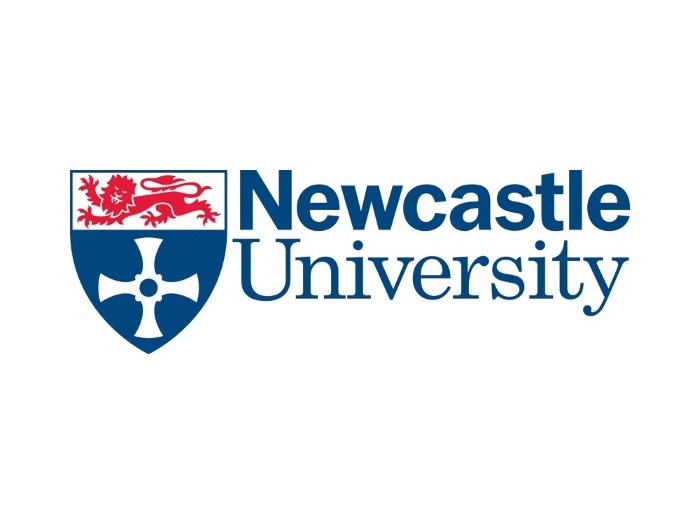 Evaluating education, training and publicity (ETP) interventions can be expensive and hard to do – it involves contacting the target audience and identifying a methodology for measuring change in attitudes, behaviour and/or knowledge. Any observed change does not necessarily equate with a change in road casualty rates. However, it is a fact that the level of road safety ETP has dramatically reduced since 2010, with budget cuts affecting the quality and quantity of activity and with many road safety teams dismantled altogether. With some areas of the country receiving little or no road safety education and training, it is likely that adverse effects on road user behaviour will start to be experienced. It could be that a combination of the biggest gains having already been made (through medical and engineering changes) and that reductions in enforcement and ETP activity are playing a part in the stagnation of casualty reduction. One area where road safety activity has reduced has been in drink-drive publicity. A Freedom of Information request from March 2014 asked questions about how much the Department for Transport had spent on drink drive campaigns over the previous decade. There was a peak in spend on THINK! drink drive advertising media expenditure of £2,962,763 in the financial year of 2008-09 which was reduced to £363,917 in 2010-11. Data for the financial year 2006-07 was not available. Between 2006 and 2010, there was a general downward trend in the number of road deaths in drink drive collisions, coinciding with high levels of road safety advertising spend. Since 2010, there has been little change in the number of people killed in drink drive collisions at a time when advertising spend has been substantially lower than in other time periods. The general standard blood alcohol limit in Europe is 0.5mg per ml (with some countries having a 0.2mg per ml limit) whilst the UK has the highest limit of 0.8mg per ml. A strong message that drink driving will not be tolerated, through increased ETP activity and the implementation of a lower limit, could have a significant effect on the number of road deaths in the UK. It seems that the publication of RRCGB 2013 brings many questions about the position of casualty reduction in Great Britain in recent years and it appears that there are a variety of factors which could be contributing to the flat-lining of rates. It could be that the biggest gains have been made and that from now on, it will become increasingly hard to achieve high levels of casualty reduction. There are external influences such as the weather and the economic situation which play a part. However, there are activities, ranging from increasing levels of enforcement and ETP interventions to changes in legislation (for example, changes to the drink-drive limit and the introduction of [Graduated Driving Licensing], which has the potential to lead to significant reductions in road casualties in Great Britain), which could have a positive effect on numbers of road deaths. 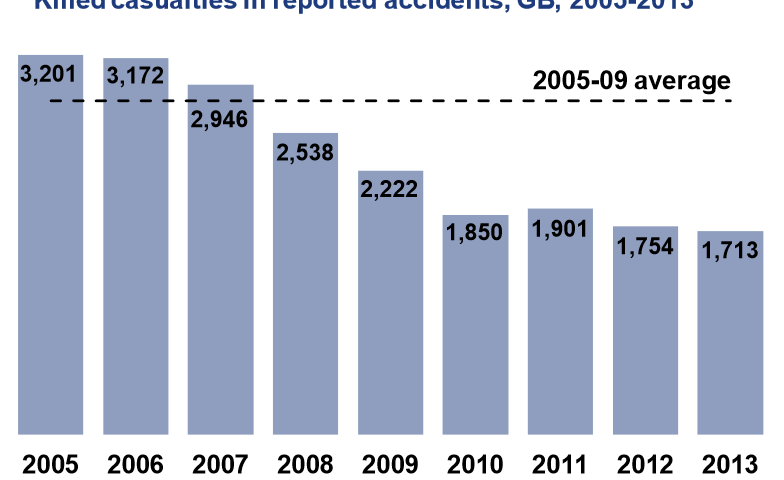 Whilst data for one quarter should not be considered statistically significant and figures are currently provisional, it is concerning to see that the trend of poor casualty reduction appears to be continuing, with increases in the numbers of pedal cyclists and motorcyclists killed or seriously injured (KSI) in the year ending at Quarter 1 of 2014. There has also been little change in pedestrian or car user KSIs. So, once again: is this the end of the golden era of casualty reduction in Great Britain?